Olivia Cleans Green: Enjoy Aromatherapy While You Vacuum! 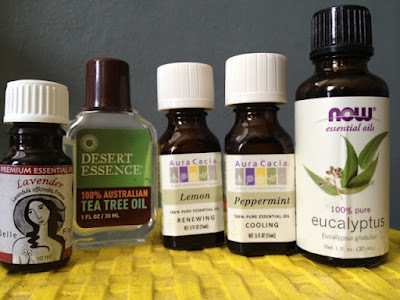 If you like adding essential oils to your DIY cleaning products, here's another easy way to enjoy the benefits of aromatherapy while you clean. All you need is a vacuum, some cotton balls, and the essential oil of your choice. I chose lemon essential oil because it is uplifting. (Who couldn't use a mood lift while cleaning?) Also, lemon gives the karate chop to negative feelings that medicinal smelling essential oils like tea tree oil and eucalyptus can bring up. Chances are you've used those while cleaning your bathroom, so enjoying some lemon oil afterwards while you vacuum can help bring you back into the happy zone. Lemon essential oil also increases concentration and awareness. No dust bunny will be left behind once you've inhaled some of this! Watch my video to see how simple vacuum aromatherapy is. You may need more oil than what I suggested in the video depending on your vacuum. I think at least 3 drops on two cotton balls is minimum. If you don't have a vacuum, just inhale some oil straight from the bottle. Whatever it takes! Visit the Aura Cacia website to learn more about the aromatherapy benefits of many essential oils and pick your favorite! Let me know if you try this and which oil you choose. thanks Shannon! have fun with your cleaning date! you and Cosmo are too cute! hugs!